The tropical climate in St Lucia does not change much during the year, the waters remain crystal blue, the foliage and flowers always evident in extravagant displays. This colourful Caribbean island, an independent state within the British Commonwealth is, appropriately, the only country in the world named after a woman. Affectionately known as St Lucy – her name originates from the Latin word “lux” meaning “light” – she is commemorated on 13th December, National Day, which was the shortest day of the year before the calendar was reformed. Thus she is seen as welcoming the incoming year bringing light into winter darkness. Fortunately for UK visitors, such celebrations may be enjoyed before the hotels High Season rates and when the daytime temperature still registers an impressive 81 degrees. December and January are the coolest months. Much of the island is covered in rain-forest, and the rain that feeds it – or “liquid sunshine” as the locals describe it – can be as torrential as it is brief. It certainly doesn’t concern the school-children who protect their smart uniforms with only a flimsy umbrella. Nobody seems to wear a coat. 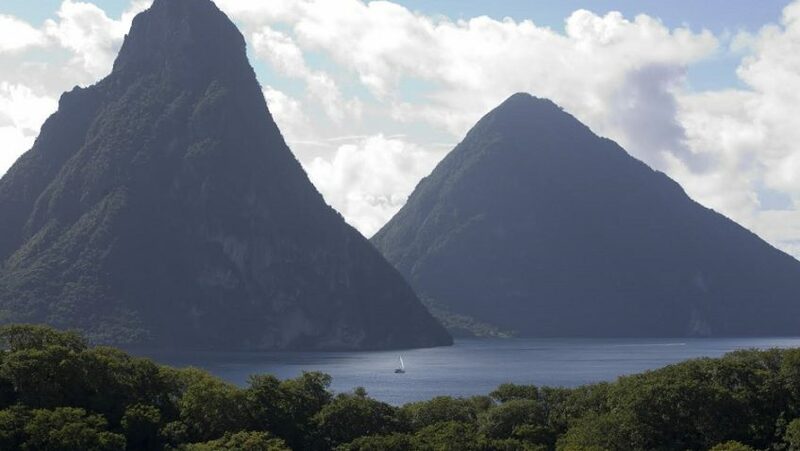 St Lucia is compact and mountainous, its volcanic terrain including broad fertile valleys leading to coastal resorts that are supported by an international airport at the south of the island. Trans-Atlantic flights arrive regularly, some of which are linked directly to cruise ships which call at the capital Castries throughout the winter. 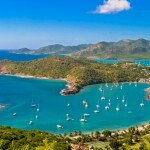 That deep water anchorage is only a short distance south of Rodney Bay Marina which is the spectacular focus of the Atlantic Rally for Cruisers. Over 300 small vessel enthusiasts will berth there having sailed from Gran Canary, Canary Islands, in time to join the National Day festivities. There are no private beaches on the island though some are only accessible from the sea. You can enjoy three of the best when you stay at a Sandals Resort which provides a shuttle service for its guests every day and evening between its trio of fabulous all-inclusive locations. While there is a wealth of water-activities to enjoy, including snorkelling, scuba-diving and whale-watching, the St Lucia visitor can find a tour for all tastes. There is a variety of heritage and culture excursions which could include a “bean to bar” chocolate experience or joining ‘twitchers’ for a spot of bird-watching. Apart from the humming-birds gathering nectar from the tubular flower display on your balcony, or the cheeky finches who may join you at your outdoor table, there are four of the island’s endemic species which can be found at Anse Chastanet, near Soufriere. Guests at the nearby Jade Mountain Hotel could see parrots as they gaze across their infinity pool towards the Piton Mountains World Heritage site. The two Piton Mountains rise dramatically from the sea to a height of 2,500 feet and the view is uninterrupted from personal living sanctuaries where the fourth (sea-facing) wall is entirely absent! All you need to do is sit up in your four-poster bed! It is a non-stop 9-hour flight from London to the Caribbean and the 4-hour winter time difference enables your morning departure to arrive in time for afternoon tea. Whether you wander to the waterfalls, visit the volcano or rock to a reggae rhythm, you can chill out in St Lucia while others are feeling the chill in the UK.